طاهرخانی, حسن, خبره, الهه. (1396). بررسی شیار شدگی و ترکهای بالا به پایین در روسازی های ترکیبی ساخته شده با بتن غلتکی با استفاده از روش المان محدود. فصلنامه علمی - پژوهشی مهندسی حمل و نقل, 9(ویژه نامه روسازی), 69-88. حسن طاهرخانی; الهه خبره. "بررسی شیار شدگی و ترکهای بالا به پایین در روسازی های ترکیبی ساخته شده با بتن غلتکی با استفاده از روش المان محدود". فصلنامه علمی - پژوهشی مهندسی حمل و نقل, 9, ویژه نامه روسازی, 1396, 69-88. طاهرخانی, حسن, خبره, الهه. (1396). 'بررسی شیار شدگی و ترکهای بالا به پایین در روسازی های ترکیبی ساخته شده با بتن غلتکی با استفاده از روش المان محدود', فصلنامه علمی - پژوهشی مهندسی حمل و نقل, 9(ویژه نامه روسازی), pp. 69-88. طاهرخانی, حسن, خبره, الهه. بررسی شیار شدگی و ترکهای بالا به پایین در روسازی های ترکیبی ساخته شده با بتن غلتکی با استفاده از روش المان محدود. فصلنامه علمی - پژوهشی مهندسی حمل و نقل, 1396; 9(ویژه نامه روسازی): 69-88. در این تحقیق تاثیر عوامل مختلف بر خرابی شیار شدگی و ترکهای بالا به پایین رویه آسفالتی در روسازی های ترکیبی با اساس بتن غلتکی مطالعه قرار گرفته است. این کار با تحلیل مدلهای سه بعدی ساخته شده با روش المانهای محدود در نرم افزار ABAQUS انجام گرفته است. تاثیر نوع مخلوط آسفالتی در رویه، نوع و محل ژئوگرید و ضخامت رویه و اساس بتن غلتکی بر عملکرد روسازی بررسی گردیده است. نتایج نشان می دهند که نوع مخلوط آسفالتی بر مقدار شیار شدگی و کرنش های کششی حداکثر در سطح تاثیر زیادی دارد، به طوری که در شرایط مساوی تفاوت تا حدود 5/2 برابری در مقدار شیارشدگی و 5/3 برابری در مقدار کرنش کششی در سطح ملاحظه می گردد. همچنین، قرارگیری ژئوگرید در وسط رویه آسفالتی باعث کاهش شیار شدگی به مقدار 32% نسبت به حالت غیر مسلح می گردد. مقدار تاثیر ژئوگرید به نوع مخلوط، سختی ژئوگرید و ضخامت رویه بستگی دارد. نسبت به حالت غیر مسلح، درصد کاهش شیار شدگی با استفاده از ژئوگرید در وسط لایه رویه از مخلوط ماستیک 1 و 2، به ترتیب، 19 و 21% میباشد. همچنین، نتایج نشان می دهند که قرار دادن ژئوگرید در وسط ضخامت رویه باعث کاهش عمر خستگی شده و قرار دادن آن در پایین رویه تاثیری در عمر خستگی نخواهد داشت. مقدار شیار شدگی و کرنش کششی در سطح رویه با افزایش ضخامت رویه افزایش یافته و با تغییر ضخامت لایه بتن غلتکی شیار شدگی تغییر نکرده ولی کرنش سطح کاهش می یابد. -نشریه 354 (1388)"راهنمای طرح و اجرای بتن غلتکی" سازمان مدیریت و برنامه ریزی کشور. -طاهرخانی، ح.، مرادلو، ا. م.، جلالی جیرندهی، م. (1395) "بررسی اثر فشار باد چرخ بر پاسخ های روسازی های مسلح شده با ژئوسنتتیک با تحلیل ویسکوالاستیک به روش المانهای محدود با استفاده از نرم افزار "ABAQUS مجله مهندسی حمل ونقل، دوره 8، شماره 2، ص 342-323. -طاهرخانی، ح، خالقی، ح. (1395) " بررسی تاثیر فشار باد لاستیک و وزن محور بر روی پاسخ روسازی ترک خورده با استفاده از روش اجزاء محدود"، مجله مهندسی حمل ونقل، دوره 8، شماره 1، ص 194-175. -مدرس، ا. و حسینی، س. ز. (1394) " بررسی خصوصیات رفتاری بتن غلتکی حاوی مصالح خرده آسفالتی" مجله مهندسی حمل و نقل، دوره 7، شماره 2، ص 313-297. -Baek J. (2010) "Modeling reflective cracking development in hot-mix asphalt overlays and quantification of control techniques" PhD dissertation. Urbana, Champaign: University of Illinois. -Brown, R., Hainin, M. R., Cooley, L.A. and Rodriguez, F. (2005) "Determining minimum lift thickness for hot mix asphalt mixtures" Journal of Asphalt Paving Technologists, Vol. 74, No. 7, pp. 23-66. -Ceylan, H., Mathews, R., Kota, T., Gopalakrishnan, K. and Coree, B. J. (2005) "Rehabilitation of concrete pavements utilizing rubblization and crack and seat methods", Center for Transportation Research and Education. Iowa State University, report no IHRB Project TR-473. -European Committee for Standardization, CEN, (2004) “Bituminous mixtures – test method for hot mix asphalt – part 22: Wheel tracking test”, prEN 12697-22 Standard. -Famili, A. and Vafaei, M. (2016) "Numerical analysis of roller compacted concrete pavement" Saudi Journal of Engineering and Technology, Vol. 1, No. 1, pp 20-25. -Gilchrist, D., Hartman, M., Mahony, J. O., Owende, M. O. and Ward, M. (2001) "Minimizing distress on flexible pavements using variable tire pressure", Journal of Transportation Engineering, Vol. 127, No.3, pp. 254-262. -Hazaree, C., Ceylan, H. and Wang, K. (2011) "Influences of mixture composition on properties and freeze–thaw resistance of RCC" Construction and Building Materials, Vol. 25, pp. 313-319. -Hua, J. (2000) “Finite element modeling and analysis of accelerated pavement testing devices and rutting phenomenon”, Ph.D. Thesis, Purdue University, USA. -Huang, Y.H. ( 2004) "Pavement analysis and design" 2nd ed. Upper Saddle River, NJ Prentice Hall. -Hugo, F. and Kennedy, T.W. (1985) "Surface cracking of asphalt mixtures in Southern Africa." Journal of the Asphalt Paving Technologists, No.54, pp.454–501. -Khabiri, M. M. (2011) “Geosynthetic material suitable depth staying to control failure of pavement rutting”, Advanced Materials Research, Vols. 255-260, pp. 3454-3458. 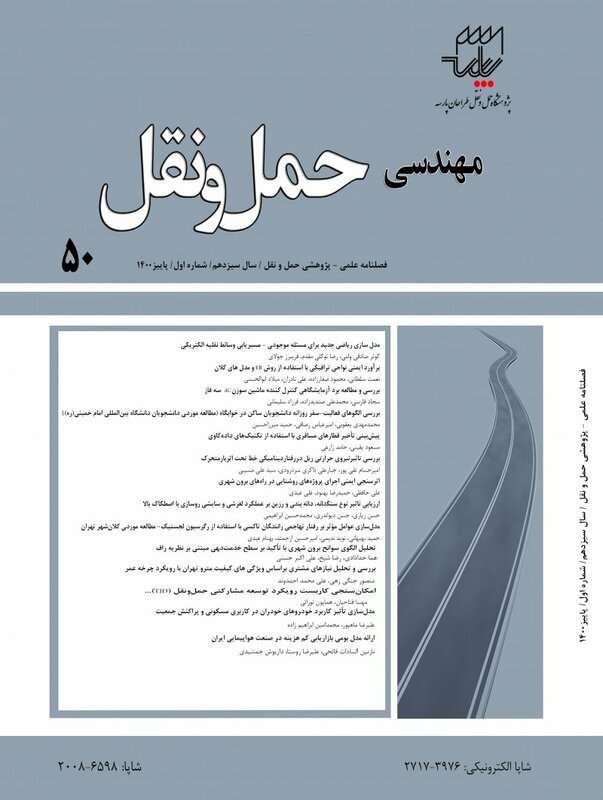 -Khodakarami, M. I. and Khakpour Moghaddam, H. (2017) “Evaluating the performance of rehabilitated roadway base with geogrid reinforcement in the presence of soil-geogrid-interaction”, Journal of Rehabilitation in Civil Engineering, Vol.5, No.1, pp.33-46. -Kokubu, K., Cabrerab, J. G. and Uenoa, A. (1996) "Compaction properties of roller compacted concrete" Journal of Cement And Concrete Composites, Vol. 18, pp109-117. -Koohmishi, M. (2013) “Evaluation of application of roller compacted concrete versus asphalt concrete as pavement surface layer for high traffic volume routes", Journal of Basic and Applied Science Research, Vol. 3, No. 5, pp. 303-305. -Krishna Rao, S., Sravan, P. and Chandrasekhar Rao, T. (2016) "Abrasion resistance and mechanical properties of roller compacted concrete with GGBS" , Construction and Building Materials, Vol. 114, pp. 925-933. -Li, S., Liu, X. and Liu, Z. (2014) "Interlaminar shear fatigue and damage characteristics of asphalt layer for asphalt overlay on rigid pavement" Construction and Building Materials, Vol. 68, pp. 341-347. -Nunez, O. (2007) "Composite pavements: A technical and economic analysis during the pavement type selection process", Master thesis, Virginia Polytechnic Institute and State University, USA. -Omran, A., Harbec, D., Tagnit-Hamou, D. and Gagne, R. (2017) "Production of roller-compacted concrete using glass powder: Field study" Construction and Building Materials, Vol. 133, pp. 450-458. -Rahman, M. T., Mahmoud, K. and Ahsan, S. (2011) "Stress-strain characteristics of flexible pavement using finite element analysis", International Journal of Civil and Structural Engineering, Vol. 2, No. 1, pp. 233-240. -Rith, M., Kim, Y. K., Hong, S. J. and Lee, S. W. (2016) "Effect of horizontal loading on RCC-base composite pavement performance at heavy duty area", Construction and Building Materials, Vol. 131, pp. 741-745. -SHRP (Strategic Highway Research Program), (2013) "Composite pavement systems –HMA/PCC Composite Pavement, Vol. 1, Transportation Research Board (TRB), Washington, DC. -Uhlmeyer, J. S.,Willoughby, K., Pierce, L. M. and Mahoney, J. P. (2000) "Top-down cracking in Washington state asphalt concrete wearing courses", Transportation Research Record: Journal of the Transportation Research Board, No. 1730, pp.110–116. -Uzarowski, L. (2006) "the development of asphalt mix creep parameters and finite element modeling of asphalt rutting" Ph.D Dissertation, University of Waterloo, Canada. -Vahedifard, F. and Mahmoud Nili, M. (2010) "Assessing the effects of supplementary cementitious materials on the Performance of low-cement roller compacted concrete pavement", Journal of Construction and Building Materials, Vol. 24: pp. 2528-2535. -Von Quintus H. L., Mallela J., Weiss W. and Shen S. (2007) "Techniques for mitigation of reflective cracking”, . Champaign, I. L., USA: Applied Research Associates; Interim report AAPTP 05-04. -Yun, T., Lee, O., Lee, S. W., Kim, I. T. and Cho, Y. H. (2011) "A performance evaluation method of preformed joint sealant: slip-down failure" , Construction and Building Materials Vol. 25, pp 1677-1684. -Zhao, Y., Alae, M. and Fu, G. (2017) "Investigation of mechanisms of top-down fatigue cracking of asphalt pavement", Road Materials and Pavement Design, DOI: 10.1080/14680629.2017.1303394. pp.